(Nanowerk News) At the quantum level, the atoms that make up matter and the photons that make up light behave in a number of seemingly bizarre ways. Particles can exist in "superposition," in more than one state at the same time (as long as we don't look), a situation that permitted Schrödinger's famed cat to be simultaneously alive and dead; matter can be "entangled"—Albert Einstein called it "spooky action at a distance"—such that one thing influences another thing, regardless of how far apart the two are. Previously, scientists have successfully measured entanglement and superposition in photons and in small collections of just a few atoms. But physicists have long wondered if larger collections of atoms—those that form objects with sizes closer to what we are familiar with in our day-to-day life—also exhibit quantum effects. "Atoms and photons are intrinsically quantum mechanical, so it's no surprise if they behave in quantum mechanical ways. The question is, do these larger collections of atoms do this as well," says Matt LaHaye, a postdoctoral research scientist working in the laboratory of Michael L. Roukes, a professor of physics, applied physics, and bioengineering at the California Institute of Technology (Caltech) and codirector of Caltech's Kavli Nanoscience Institute. "It'd be weird to think of ordinary matter behaving in a quantum way, but there's no reason it shouldn't," says Keith Schwab, an associate professor of applied physics at Caltech, and a collaborator of Roukes and LaHaye. "If single particles are quantum mechanical, then collections of particles should also be quantum mechanical. And if that's not the case—if the quantum mechanical behavior breaks down—that means there's some kind of new physics going on that we don't understand." The tricky part, however is devising an experiment that can detect quantum mechanical behavior in such ordinary objects—without, for example, those effects being interfered with or even destroyed by the experiment itself. Now, however, LaHaye, Schwab, Roukes, and their colleagues have developed a new tool that meets such fastidious demands and that can be used to search for quantum effects in an ordinary object. The researchers describe their work in the latest issue of the journal Nature ("Nanomechanical measurements of a superconducting qubit"). 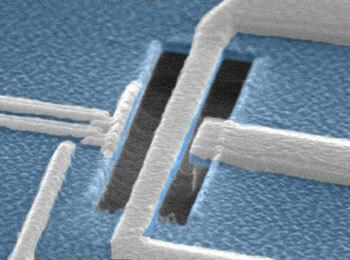 In their experiment, the Caltech scientists used microfabrication techniques to create a very tiny nanoelectromechanical system (NEMS) resonator, a silicon-nitride beam—just 2 micrometers long, 0.2 micrometers wide, and weighing 40 billionths of a milligram—that can resonate, or flex back and forth, at a high frequency when a voltage is applied. A small distance (300 nanometers, or 300 billionths of a meter) from the resonator, the scientists fabricated a second nanoscale device known as a single-Cooper-pair box, or superconducting "qubit"; a qubit is the basic unit of quantum information. The superconducting qubit is essentially an island formed between two insulating barriers across which a set of paired electrons can travel. In the Caltech experiments, the qubit has only two quantized energy states: the ground state and an excited state. This energy state can be controlled by applying microwave radiation, which creates an electric field. Because the NEMS resonator and the qubit are fabricated so closely together, their behavior is tightly linked; this allows the NEMS resonator to be used as a probe for the energy quantization of the qubit. "When the qubit is excited, the NEMS bridge vibrates at a higher frequency than it does when the qubit is in the ground state," LaHaye says. "Quantum jumps are, perhaps, the archetypal signature of behavior governed by quantum effects," says Roukes. "To see these requires us to engineer a special kind of interaction between our measurement apparatus and the object being measured. Matt's results establish a practical and really intriguing way to make this happen."